In late August, nearly one hundred office cleaners at WeWork locations throughout Manhattan lost their jobs after they began protesting unfair working conditions. The office cleaners were not employed directly by WeWork, a multi-national co-working startup valued at ten billion dollars; rather, they were employees of a cleaning contractor called Commercial Building Management. Such arrangements insulate employers like WeWork from having to negotiate with unionized labor, and makes organizing such workplaces difficult. 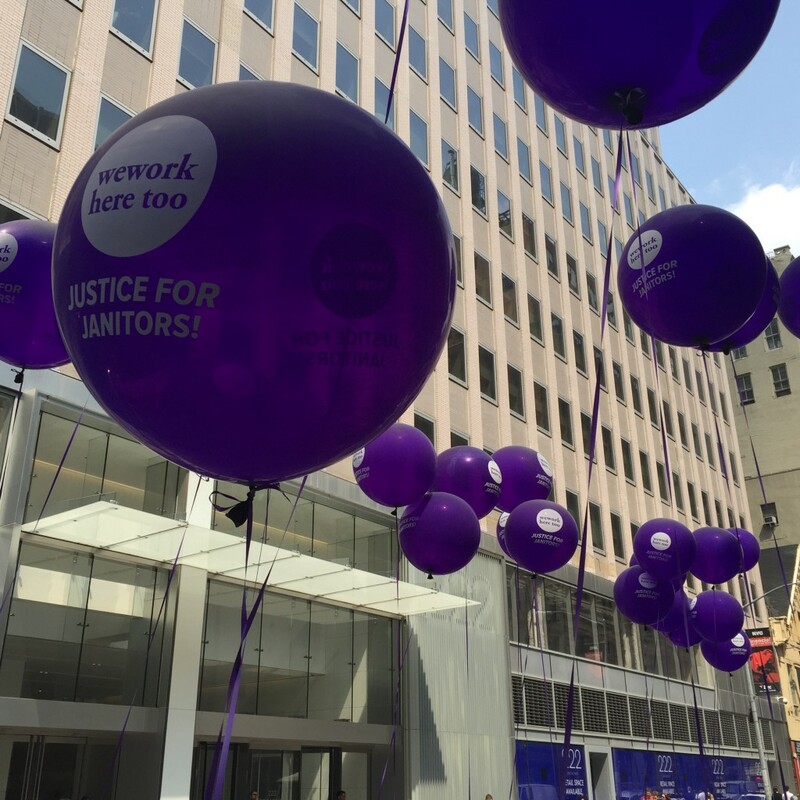 The CBM cleaners at WeWork’s offices in New York were making eleven dollars an hour or less, without benefits; according to SEIU-32BJ, the service workers’ union, the prevailing wage for unionized office cleaners in New York is twenty-three dollars an hour, with full benefits. “I’m sick of just going to the Hamptons, with the same people doing the same things,” said Margot Vitale, 23, a merchandising assistant at Saks Fifth Avenue. She attended Summer Camp with her friend and University of Southern California sorority sister Olivia White, 23, who runs a bedding company called 41 Winks out of WeWork’s SoHo West offices. “I’m planning on meeting my husband here,” Ms. Vitale said with a laugh. This week, BuzzFeed reported that WeWork has so far only rehired fifteen cleaners formerly employed by CBM. The other positions have been filled with new workers; twenty five spots remain, for which candidates are still being interviewed. “I’m a big believer in what unions have done for this country,” WeWork President and Chief Operating Officer Artie Minson told BuzzFeed’s labor reporter Cora Lewis. “Some of my former family members were in unions.” Earlier this summer, a WeWork executive allegedly threatened to fire any cleaner who attempted to unionize, and Lewis reported that none of the six rehires she had spoken to supported unionization. A union just wouldn’t be right for WeWork (hmm), Minson said: “Independent voices among our employees go against everything we stand for as a company.” Next year, those who are hired as CSAs and CSLs will be invited to Summer Camp. In August, WeWork expanded into Brooklyn, opening up its first location in a made-up neighborhood called “Dumbo Heights,” brought to you by Jared Kushner. WeWork is also going to be the anchor tenant at a six-hundred, seventy-five-thousand square-foot space in the Brooklyn Navy Yard. “On every floor of the building there will be two kegs,” the company’s mysteriously charismatic co-founder Adam Neumann said on Bloomberg’s “Market Makers” while discussing the importance of networking over food and alcohol. “An interesting thing about our members is you will never see them abusing that,” he added. WeWork is developing the Navy Yard building in partnership with two major players in the national real estate elite. “The $380 million project,” Bloomberg Businessweek reported last month, “will be the first in Brooklyn for both Boston Properties, the largest U.S. office real estate investment trust, and Rudin, a family-owned company that’s marking its 110th year in business.” As it happens, Mort Zuckerman, the chairman and co-founder of Boston Properties, is personally invested in WeWork, and the company is developing its first “WeLive” residential apartments in New York at 110 Wall Street, which is owned by Rudin. WeWork has been slow to release details about the WeLive project, initially developed at a WeWork-owned property outside Washington, D.C. As I understand it, WeWork wants to create an environment that anticipates and provides for anything and everything its tenants — and maybe, eventually its workers? — could possibly need: You sleep there, you eat there, and you work there. And soon, perhaps, you can play there, too: I’m told that WeWork is developing something called “WeWork Club” at its 85 Broad Street location in what was once Goldman Sachs’ office lounge. WeWork, WeClub, WeSleep — and then we do it all again tomorrow.